NOTE: THIS PIECE HAS AN AUDIO COMPONENT. CLICK ON THE ARROW BELOW TO HEAR THIS PIECE READ BY THE AUTHOR. Scene: Frasier is interviewing Daphne for the position of live-in housekeeper and physical therapist for his father. Personalities of these characters are being hammered into one another for the first of what will evidently be many times. The Manchesterian Candidate has just claimed possession of psychic abilities, which apparently rubs Frasier in a way not unlike that of a holey sock to a blister. Frasier: No, I’m a psychiatrist. Far be it for me to stuff words into a dead lady’s mouth, but I don’t think she’d have minded being the harbinger of a half century of increasingly bad jokes. She knew — and said she loved — that hers was the most distinctive voice in a crowd, and there’s no reason to think that would have changed just because the daisies she’s been pushing have taken over the garden. And some of the lines later plied with her peals were titter-worthy. But she — or her voice, inasmuch as she owned it — had one real transgression, for which she was just a puppet: it was responsible for the longevity of Frasier, unscientifically proven to be the least funny in a long and grueling line of unfunny television sitcoms. Let’s back up. DeDe Ball [mother of Lucille, Requiscat etcet to both], brimming over with pride for her daughter in the way that mothers do, is known to have attended every taping of the I Love Lucy show, where she regularly out-laughed her studio audience compeers. Hers were big, gut-busting, ferociously contagious emissions – there was no more effective kind, as far as television sitcoms go. 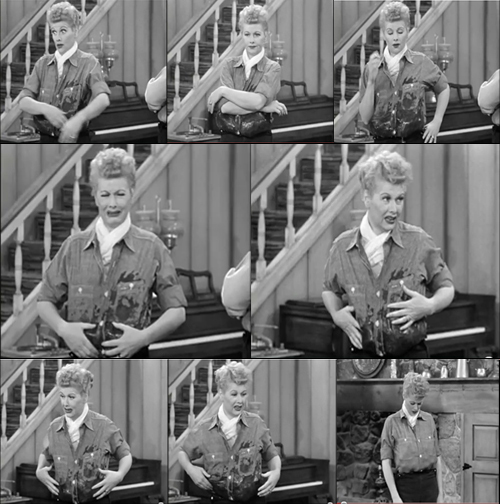 Now, half-believable cultural legend has it that Lucy’s show [with its reliance on sight gags coupled with Lucille’s versatile maxillofacial muscles and uncanny ability to flap them] was used in the earliest recordings of audience laughter that would later serve to “sweeten” less punchy comedy on television’s laugh tracks. The scene worked reliably to this model: Desi Arnaz would set things in motion by walking in as Lucy was getting herself into heaps of trouble, in his signature Havanese style [Lu-cy, I’m ho-ome], at which point Lucy would react without words [generally a knowing grimace that prefaced her futile attempt to cover up whatever mess she’d gotten herself into this time], and in that unrestrained moment, silent except for the waves of laughter from the audience, the sound man on the production would have a clean and easy-to-sample audio track to use later. And, because it was the Lucy show, the laughter that was saved, more often than not, belonged to the eminence grise of DeDe. The original intentions behind the laugh track were mostly benign [even altruistic, maybe, as original intentions can be]. As considered by the sound guys [serious audio geeks], the addition of recorded laughter was meant to even out a show’s sound levels, technically, and fill in the otherwise awkward silences left by the reshoots that inevitably took place after a studio audience returned [to their own less hilarious lives]. Later, a lone home viewer would maybe even achieve a sort of solidarity with DeDe Ball and others [or so they hoped], and as such, be more inclined to relax into a program, and maybe even to laugh, to connect by proxy to the situation. Nobody intended those original voices to be the same as those used in laugh tracks fifty years later, and nobody really has a good explanation for why those specific people are still laughing in our collective faces. I’m guessing that it was a self-directed groin-kick, and that by the time later audiences were brought in to record, the life had already been sucked out of sitcoms and it just wasn’t possible to get them up to collective snuff. And, if you’ve ever attended a taping of a live program, you’ll know that the warm-up comics hired to work up an audience is a mushy spitball compared to DeDe’s ballistics. It’s starting to sound as if Frasier kicked the personal puppy of your correspondent, so know now that this isn’t a personal grudge. It may be a fine program, as far as I know. I can’t tell; I’ve never been able to tolerate more than a nibble without reaching for the antacids. Were the people responsible for this laughter back in their bodies and sharing a live environment with me, I’d likely rudely shish them, probably several times over the course of the show, and later I’d write a blog post all about the decline of social mores in live comedy venues. And it would be the most cluelessly indignant polemic ever posted to a blog, and Frasier himself would respond or maybe the paranormal sector would try to rouse DeDe herself so that she could chime in [at which point, rest assured, she’d just confirm what I’ve already said.]. While alive, these people laughed from their gut to fill a soundscape silent from sight gags, and now, as dead windbags, they’re uproarious over a whole lot of nothing. The scene opens on Martin and Daphne having dinner when Niles and Frasier walk into the apartment. Daphne: Hello. How was the Wine Expo? Love love love the descriptions of the laugh track. Brilliant. With a distinctive lilt whose origins are best attributed to continental drift, Miette Ornes began narrating books as a way to get under the hood of great writing. As hostess and producer of Miette's Bedtime Story Podcast, she has spent the past six years compiling a continually growing anthology of the world's greatest short fiction. Sometimes she's also a writer.